Not too long ago I blogged about Donruss and their trigger-happy designers who created almost a dozen different cards from their 1989 design. One card I left out due to lack of knowledge of its existence was the Blue Chip Cards release. I checked my trusty Standard Catalog of Baseball Cards, did several searches on-line and could find no information on the origin of these cards. The best I can add is that according to Sports Collectors Digest, the Mark McGwire has a book value of $400 dollars. 1989 Donruss Blue Chip Cards is a 12-card set featuring Keith Hernandez, Mike Greenwell, Dave Winfield, Jose Canseco, Mark McGwire, Kevin McReynolds, Mike Marshall, Walt Weiss, Franklin Stubbs, Danny Tartarbull, Jesse Barfield, and Ellis Burks. You would think that by now someone would have figured out just where did these cards come from and what was their purpose. Obviously the print run on these is extremely limited considering the lowest book value is $60 dollars for a Walt Weiss and others. Where is a Donruss historian when you need one? …or even, just a former employee! 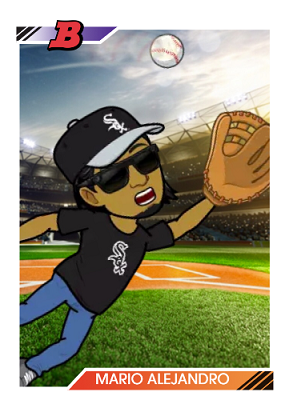 Seriously, I’m surprised nobody who comments on this blog is a former employee at either Topps/Upper Deck/Donruss. Or, maybe there are some former employees who read this blog but prefer to lurk instead? BTW- You meant Keith Hernandez, right? I remember Brian the Canseco Super collector had one of these in his slideshow. If i remember his advice correctly it was if you ever find one of these cards buy it at any cost. Among canseco collectors its right up there with the 88 topps cloth test from what i understand. I bet you could see a sale of $500 for the canseco no problem. It’s obviously a Canadian set. Any one else think that these were at one point just released into the hobby to drum up interest in vintage. A few blogs always talks about busting junk wax boxes with no gimmicks, like I said before if these cards are 17-20yrs old they should have surfaced back in the early 1990’s. Think if the blue chips are harder than 1991 elite, we would have heard. To answer your question, the Donruss historian is probably on the unemployment line somewhere. It’s always fun to go back and see some of the players that were included in these subsets. Marshall/Weiss/Stubbs mixed in with Winfield/Canseco/McGwire, lol! You need to get ahold of cardcop. He rambles a bit but does know a lot about this stuff. I will get you an email address later today. Wow, glad there’s no Reds in the set. Based on the “Leaf” marking on the front I would gather these cards were only released in Canada (similar to O-Pee-Chee cards realeased by Topps). I wouldn’t be suprised if they were a send away, food promotion, regional release, or possibly a special subset in “Leaf” factory set (not sure if they were available then). 1990 was the first year that “Leaf” brand was introduced into the states as its own seperate brand (and one of my all time favorite releases). Dang. As both a Keith Hernandez and Kevin McReynolds collector, this set has stymied me for a while. This is the first time I’ve ever even seen the design, though, so thanks for that! Are the write-ups on the card back back bilingual – English & French? If they were made for the Canadian market they have to be bilingual. That is the logo of the Canadian Leaf on the front. I think the last year of the Canadian Leaf was 1988. Funny how there is virtually no information on this set. Could it have been a test set that was distributed years after being made? Or a send-in set? There is both a “Leaf” and “Donruss” version of the Blue Chips. 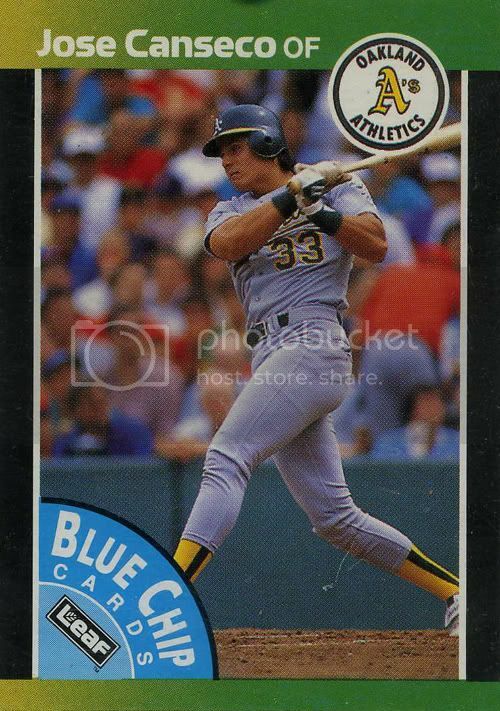 I once bought both Donruss & Leaf versions of this Jose Canseco card in 1998 for $75. I talked the guy down from $150. I ended up with 2 of each versions. I sold the extra Donruss for $225 and the extra Leaf for $300. I have since sold off my Canseco collection. The guy I bought them from also had the 2 McGwire versions & the Ellis Burks Donruss. The story is this…..In 1989 Donruss made many different cards with this border…one of the sets being the Blue Chips set..Eventually that set was scrapped in exchange for the Grandslammers set…these Blue chip cards were to be destroyed but the guy in charge of the press saw a huge monetary potential and snuck out some sets….he held on to them without telling anyone in fear that it would cost him his job….he died before he could capitalize…they were part of an estate sale…..upon reaching the public no one had ever heard of them so at first they were not seen as valuable….then once the story came out, the sets had been broken and only singles have surfaced since…I know of 1 person that has all but the Stubbs and the McReynolds…. Hey DJ shoot me an email – just click my name to see address. Sure wish I could get a McGwire from this set! I have several Stubbs and Mcreynolds cards I would part with. hey Arthur its me hector again umm if you can call my friend at 626 926 6261 his name is Robert and he wants to talk to you thank you he is really interested in the stubbs. Hernandez, Walt weiss, Kevin Mcreynolds. Danny Tartabull, Any interest? I’m still looking for the McGwire Blue Chip. Is it the last one missing from my personal collection. I’m still looking for the Mcgwire Blue Chip. I really need this one! Would love to know where you found a price guide for these — I’m looking for a price on a PSA 8 Keith Hernandez 1989 Leaf Blue Chip. Just like the Aqueous tests, I have seen quite a few and some press quality counterfeits out there and the problem with this set is, unlike the Aqueous Tests, “Leaf/Donruss” will not define a fake as counterfeit and/or pursue any known “Printers” since they scrapped this design… It’s simply considered an “altered” card not illegal. Just a beware.